Bartlett and Bosc pears. Develops on pears which have been stored beyond their postharvest life. Brown to black discoloration of the skin associated with fruit which have become yellow in storage and lost their capacity to ripen normally. Browning is initially restricted to the skin but progresses rapidly into the flesh, particularly upon transfer of the fruit to warm temperatures. Browned skin becomes weak and is easily sloughed off in later stages of senescence. Often associated with core breakdown. Decay may follow secondarily. Taste and odor of the fruit are very disagreeable even before discoloration begins. Fruit have reached the end of their postharvest life. Tissue begins to die and fermentative metabolism occurs resulting in alcoholic odor and off-flavors. Avoid storing the fruit beyond its postharvest life. To extend the postharvest life maximally, harvest fruit at optimum maturity for the length of storage, cool fruit rapidly and thoroughly after harvest, and store at the lowest, non-freezing temperature (often -1 to -2°C, 28 to 30°F). Controlled atmosphere storage can extend the postharvest life of the fruit up to twice that achievable in air storage. Watch for change in fruit color from green to yellow. Yellowing is an indication that the fruit's storage life is nearing the end. 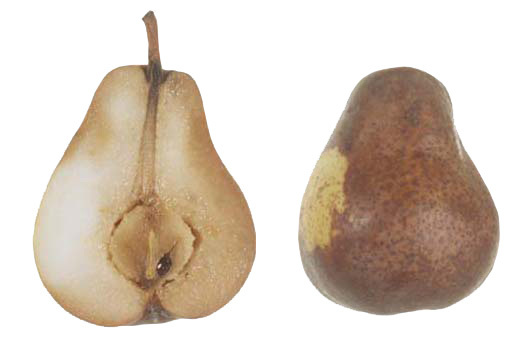 Market Diseases of Apples, Pears, and Quinces. 1971. Agriculture Handbook No. 376. Agricultural Research Service, USDA.